The Instant Pot Egg Loaf is the greatest hard boiled egg hack ever! 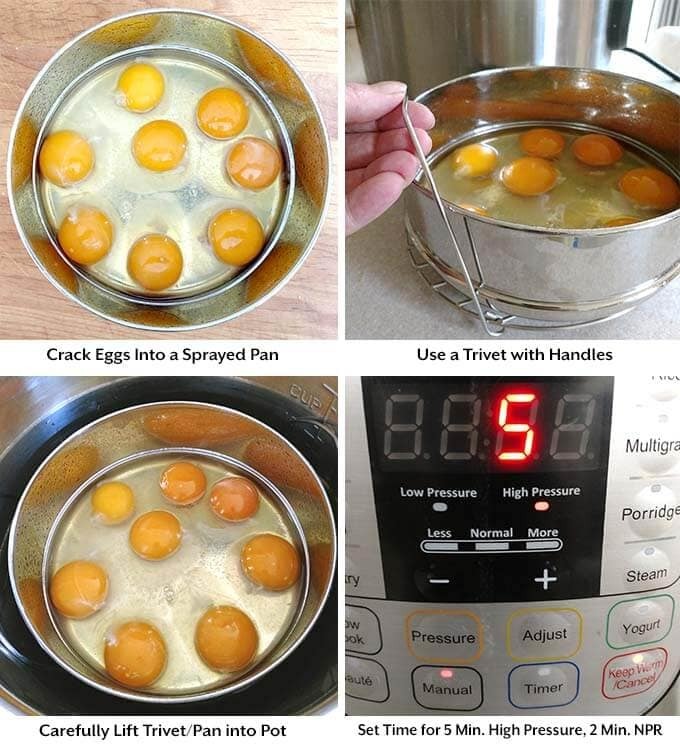 A speedy and efficient way to hard cook several eggs at once, and not have to peel them! 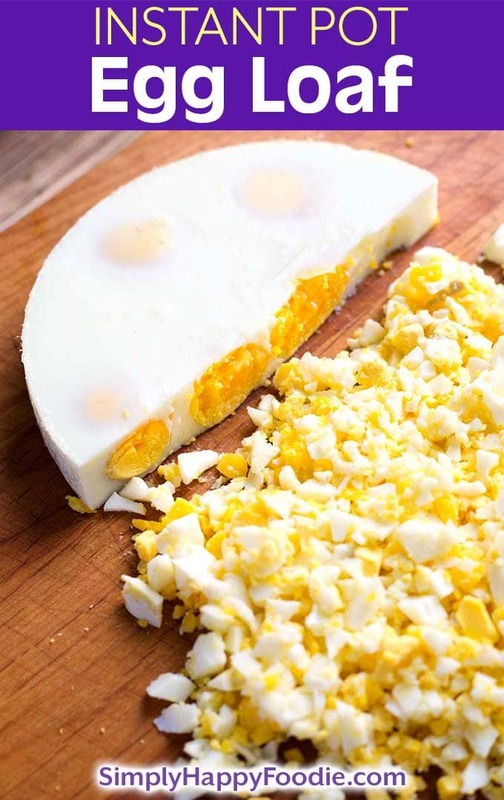 This recipe makes an egg “Loaf” that you can just chop up when it is done cooking! Making a pressure cooker egg loaf is so easy! The best Instant Pot eggs! I used to do this in the microwave, back in the day. If I didn’t get the power set to the right level, the eggs would pop and explode, and make a mess in the microwave. Not fun to clean! Thank goodness for the Instant Pot®! This is yet one more reason I love it! This time of year there are lots of eggs being cooked. With Easter just around the corner, they are at a good price. And, with Spring having begun, I’m thinking about sandwiches! I don’t really know why, but I don’t eat many sandwiches in the Winter (I’m all about comfort food!). So if you love a good egg salad sandwich like I do, the Instant Pot Egg Loaf is a wondrous thing! The Instant Pot Egg Loaf is the best egg hack I’ve seen, and I use it all the time. I hope you find it useful, too! 1) Mix the dressing ingredients together and add to the eggs. 2) Mix well and serve on bread. Watch me make this Instant Pot Egg Loaf and Egg salad! The Instant Pot Egg Loaf is a speedy and efficient way to hard cook several eggs at once, and not have to peel them! This recipe makes an egg "Loaf" that you can just chop up when it is done cooking! Making a pressure cooker egg loaf is so easy! Add the water to the inner liner pot. Spray the oven safe dish with nonstick cooking spray. Crack the eggs into the oven safe dish. Set the dish on the trivet/rack, grasp the handles, and carefully lower it into the pressure cooker's inner liner pot. Press the Pressure Cook/Manual button or dial, and then the +/- button or dial to select 5 minutes if using a 7" pan* (6 minutes if using 6" pan). Use High Pressure. If they don't fully cook in the time given, just put the lid back on and let them finish cooking in the residual heat. When the cooking cycle has finished, let the pot sit undisturbed for 2 minutes. Then turn the knob to the Venting position to quick release the remaining steam/pressure. When the pin in the lid drops down, open the lid. Use oven mitts (I like the silicone ones) to grasp the handles and carefully lift the pan out of the pressure cooker. 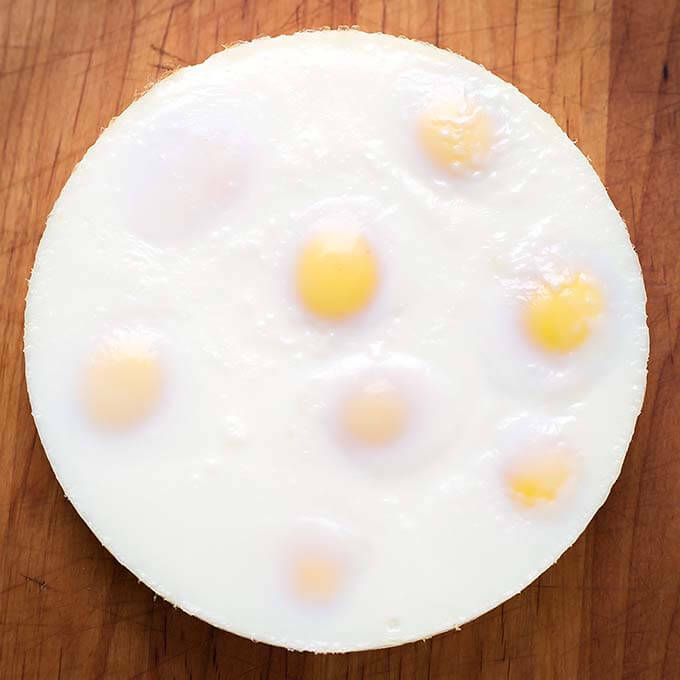 Invert the pan onto a cutting board to remove the egg loaf, and let the egg loaf cool. 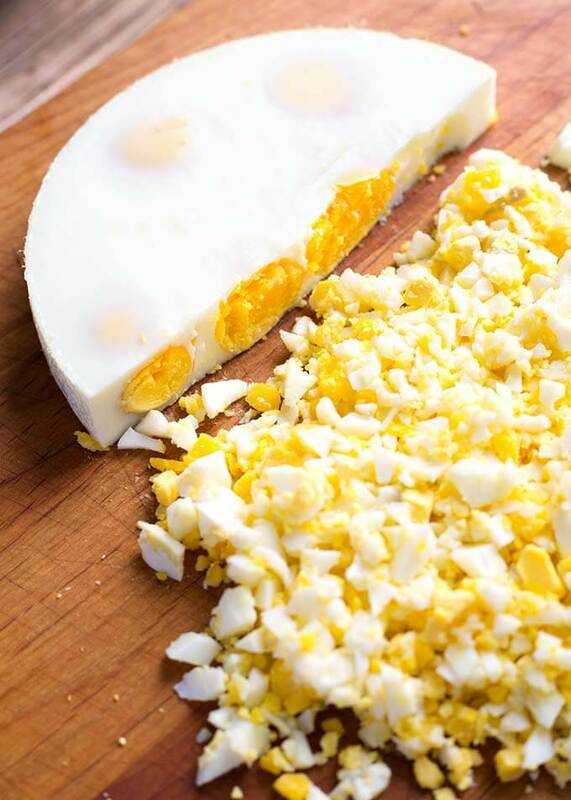 Chop the egg loaf up to desired size and use in egg salad, potato salad, or other recipes! Cooking time may be longer with thicker glass dishes, and with smaller diameter dishes, as the egg loaf will be thicker. When I used your great idea, I added one more step…use a pastry blender to chop the eggs into the small pieces. Ginger, that is genius! Thanks for the tip! I was going to say the same thing. A pastry cutter works beautifully to chop up hard boiled eggs. I only wish that I had thought of it years ago! Love the tip! Thank you! Genius! I love boiled eggs and eat them a few times a week. Toasted whole grain English muffin, ripe avocado and boiled egg with Spike seasoned salt. Oh yes! Can’t wait to try this! Hi Lorrie! I’m so excited that you are so excited! Your use of the egg loaf sounds way more exciting than mine. I’m on a potato salad, egg salad kick right now. I hope you have fun making your egg loaf! this is a genius at work !! thank you for sharing . i luv my IP more everyday ! 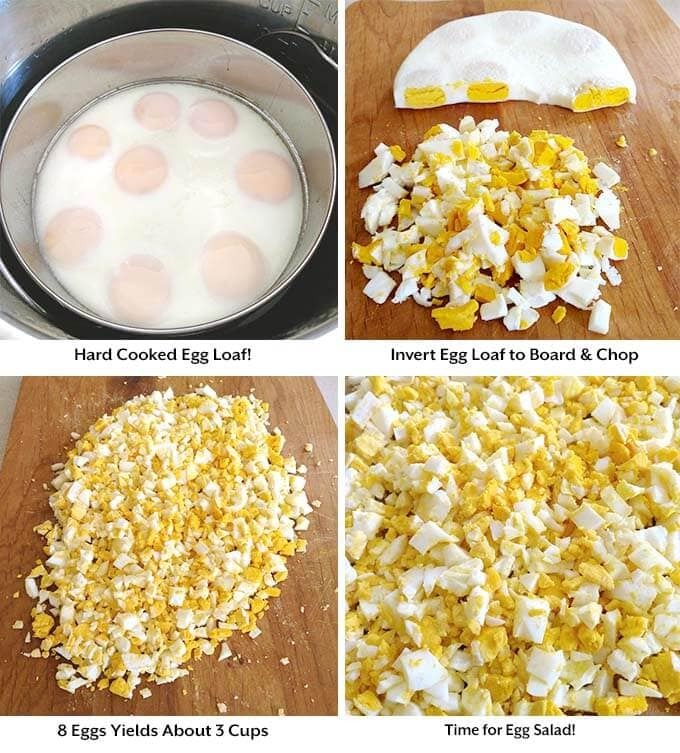 This is such an awesome idea, I will be doing this from now on when I make my potato salad and with the left over eggs I can make the egg salad. Awesome!!!! It is just so easy! Have fun! This is a great idea. Could i use a double broiler? Or a slow cooker? I don’t have a pressure cooker. Hi Sarah, I don’t see why not! If you use a slow cooker, spray it really well first. Cook on Low. I don’t know the time, but maybe a couple of hours. I would try a slow cooker liner. When it’s done just pull the bag out & flip it inside out. I would spray with non stick spray just to make sure it releases easily but you have no cleaning the slow cooker this way! I happen to think slow cooker liners may just be the best invention ever (next to the pressure cooker). Can you use a crock pot liner in the pressure cooker? Great idea! I haven’t made this yet (new to the IP community). Here’s an idea. Use a cookie cutter to cut out the size needed to make an egg sandwich. Chop the pieces that are left for egg salad, tuna salad and the like. Also for adding to your green salads. It really is a great shortcut! I love the cookie cutter idea for an egg sandwich (one of my faves!). Thanks for the tip! Hi Paul & Jaci! What a great idea! Have fun with the Egg Loaf! Thank you for your comment! Again not for the mini so frustrating Time to yard sale it or trash it. I just made this egg loaf in my Mini yesterday. My favorite pans for it are actually from Pampered Chef. It’s a set of 3 small cake pans meant to make a layer cake with. Nonstick, and it works well. I’m so sorry you are feeling frustrated. Is our recipe for the mini as well as 6 and 8 qt instant pots or do I need to use fewer eggs and less water? You can make this recipe in any sized IP. I use a 7″ pan for the 6 and 8 qt, and a 6″ pan for the 3 qt (either remove 1 egg, or add 2 minutes cook time for 3 qt). I find the times are not much different in the mini, For ingredients just use a 6 quart recìpe, but cut ingredients in half. Perfect for hubby and me…..
Could you use the pan that comes in the instapot? Hi Cathy, no, you will need some kind of oven safe dish or pan, sitting on the trivet, with water underneath to create the steam that builds the pressure. Check your dishes and see if any are oven safe. Hi. I wonder if I can scramble, add spinach , etc, and make a loaf? I don’t have a muffin pan. Hi Elyse, check out my breakfast burritos recipe: Instant Pot Breakfast Burritos. You don’t have to stir it. Can I use a spring form pan? Sure, as long as it’s not too leaky. The eggs should cook pretty fast, so it might not be an issue. I’d try it! I made this in my instapot duo mini using a Pyrex bowl. I had to cook it for 5 minutes and natural vent for 5. Came out perfect. I will use this method for making egg salad from this point forward. Thanks! Has anyone ever frozen leftovers? Just wondering how it would be after thawed. I loved tge cookie cutter idea and would like to cut some out and freeze to be ready for breakfast sandwiches. Egg whites will be tough after being frozen. Total game changer! Thank you! This idea is so cool, thanks! I only had an 8” Caphleon non stick round “cake?” pan, but following your directions worked great. I used 12 eggs, and set my 8 quart Instant Pot with 2 cups water at 6 minutes, 3 minutes of natural pressure release. The eggs came out perfectly for egg salad! My young kids loved your egg salad recipe as well! Thanks again! Hi Stew, thank you for your review! 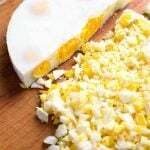 I’m happy you found this recipe, so now you can make egg salad for your kiddos more often! So glad you all liked it! For year;s I had to hard boil the eggs and then peel them. Lots of work. Sandy, your recipe in the Instant pot for hard boiled eggs is just sooooo much easier now. I like this for cooking one of our favorite breakfasts, creamed eggs on toast or biscuits. Those eggs just come out so beautiful; I can’t stand it !!! Not really, they are gorgeous just to look at before I start chopping them up. Thanks a million, you have made my cooking life so much easier. I don’t see anything about water. Do you use water? If so, how much, please? Yes, water is first on the list on the recipe card! You need water for te pot! Just made in 3qt mini and this is what I did. I am at 4000 feet. Sounds perfect, PattiAnn! Thanks for the update!